Our magnificent Knight is a real heartbreaker. 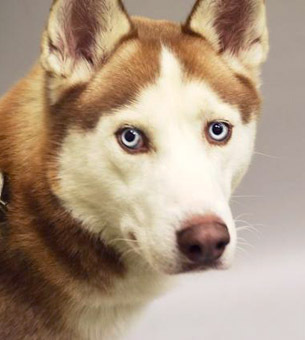 This gorgeous boy was surrendered by his owners to NYC ACC, at the age of three, because they were ill-prepared to handle an active Husky adult. I wish I had a nickel for every time someone purchased an adorable, fuzzy, Husky puppy, because they wanted to indulge their inner Wild Child, and experience the illusion of owning a wolf. 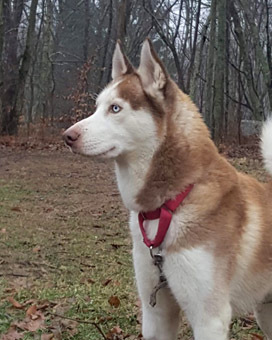 Huskies are not for everybody, and it is a grave disservice to these magnificent dogs if their owners do not follow through on training, leadership and exercise. Knight is a perfect example of this shortsighted thinking. His social development period had been sorely neglected, leaving him behind the learning curve in manners and obedience training. Knight was at immediate risk in NYC ACC, because owner-surrendered dogs are allowed just 48 hours to impress shelter staff, so that they can join the Adoption Program and have a chance at a forever family. Knight passed his behavior evaluations and was poised to go to adoptions, when he came down with the shelter kennel cough. Instead of getting adopted, Knight was heading for the euthanasia list. We jumped at the chance to invite this handsome boy to our Rescue, so that we could get him the vet care that he needed and put some polish on his manners. After a rough start, Knight adjusted to foster care and began to follow our rules and routines. 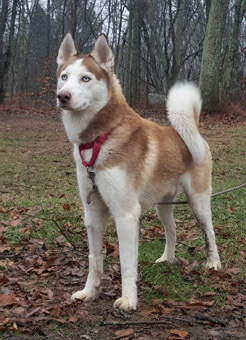 He has revealed to us one of the most outgoing and friendly Siberian Husky temperaments that we have seen. 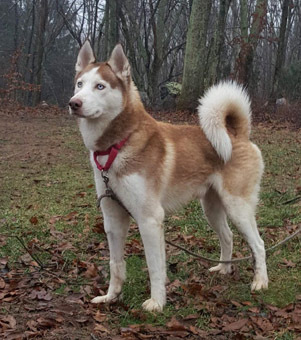 He would be a great fit for an active Husky savvy adult home, with folks who have the time and inclination to provide adequate exercise. Knight is a high-energy dog with a good deal of puppy mojo in his demeanor. He needs serious exercise including leash walks, hiking or running. He wouldn't be happy as a couch potato, that's for sure! 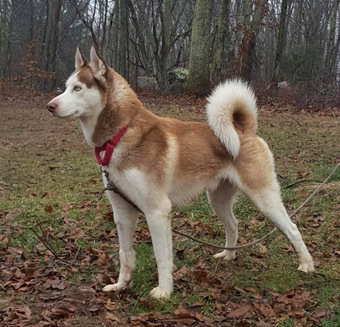 Knight is an active, athletic dog at 45 pounds, and is at his mushing prime age! The more action he gets the better. As an energetic adult, Knight's pack manners needs some tweaking. He loves to play, and can be pushy with other dogs, who may rebuke his advances. 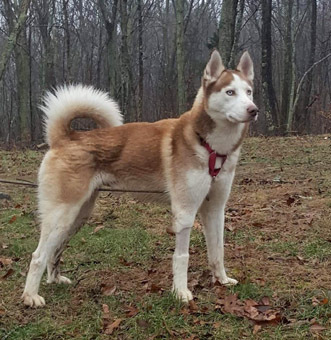 While he may not be a good fit for a senior or low energy dog, Knight could join a home with another active adult, who has an energetic play vibe. Knight has lived happily with older kids in his former home, but as a high-energy dog, he could easily knock down toddlers, or steal their food, so we would like to have him progress in an adult home. We're not a fan of Huskies and cats, and we feel Knight would chase them beyond their tolerance. Knight has improved his house manners, but adopters should plan on dog proofing the premises. He is house trained, and now crate trained, but adopters should expect to troubleshoot the occasional accident that will inevitably occur during his transition to a new home. He is in excellent health, and is at an ideal weight of 45 pounds. Adopters should maintain his weight in this range. Knight has been recently neutered and is vaccinated for rabies, DHLPPC (distemper, hepatitis, parvo, parainfluenza and coronavirus), and canine flu. He has been boostered as needed. He has had the 4dx test, and is negative for heartworm, lyme, earlichia and anaplasmosis. He has been dewormed, and microchipped. 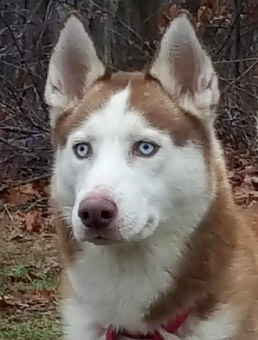 If you are interested in Knight, please write to Angelsfrgod@aol.com or call/text Denise at 860-908-9738 for more info.